Clinical Application of Epigenetic Biomarkers—What are the Pitfalls? Professor of Biology, University of Alabama at Birmingham, Birmingham, AL. Dr. Tollefsbol is a Professor of Biology and a Senior Scientist in the Center for Aging, Comprehensive Cancer Center, Nutrition Obesity Research Center, and the Comprehensive Diabetes Center at the University of Alabama at Birmingham (UAB). He is Director of the UAB Cell Senescence Culture Facility which he established in 1999 and a Steering Committee Member of the UAB Center for Aging. Dr. Tollefsbol trained as a Postdoctoral Fellow and Assistant Research Professor with members of the National Academy of Science at Duke University and the University of North Carolina. He earned doctorates in molecular biology and osteopathic medicine from the University of North Texas Health Sciences Center and his bachelor’s degree in Biology from the University of Houston. He has received prior funding from the NIA, NCI, NHLBI, NIMH and other federal institutes as well as the Glenn Foundation for Medical Research, Susan G. Komen for the Cure, the American Federation for Aging Research (AFAR), and the American Institute for Cancer Research (AICR) among many other sources. The Glenn Foundation for Medical Research funding was unsolicited and was awarded to Dr. Tollefsbol for lifetime contributions to the field of aging. In 2006 Dr. Tollefsbol was selected and highlighted as part of the 25th anniversary of the AFAR for significant contributions to aging research. Dr. Tollefsbol’s research interests have covered a wide range of topics such as aging, epigenetics, nutrition, cancer, telomerase, and caloric restriction. Work from his laboratory has been featured in Women’s Health magazine, Shape magazine, and the AICR Newsletter and Dr. Tollefsbol has been a Scientist in the Spotlight in ScienceNow. Currently he serves as an Associate Editor for Frontiers in Epigenomics and is on the Editorial Boards of the international journals Open Longevity Science, Epigenetics of Diabetes and Obesity, Molecular Biotechnology and Clinical Epigenetics. He is also a contributing Editor of Lewin’s GENES X classic textbook. Over 25 of the publications from Dr. Tollefsbol’s laboratory have received national or international accolades such as best paper award, selection for press release by the journal editors and featured on the journal homepage. Dr. Tollefsbol has been invited to give presentations on his research in many countries including Germany, China, Italy, Switzerland, France and The Netherlands as well as at various leading institutions in the US such as Harvard Medical School, Tufts University and the University of California at San Francisco. His research has received considerable media attention both nationally and internationally through television, newspaper and radio venues and has been highlighted in eScience News and ScienceDaily. 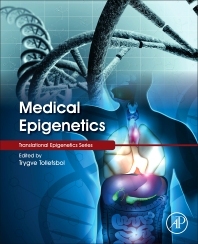 He has ten books which have been published or are in progress and a recent book on “Epigenetics of Aging” that Dr. Tollefsbol co-authored and edited was highlighted in Nature.